We are a small friendly group who meet on Saturday mornings from 10 till 12 o`clock during the Autumn and Winter and Spring months and for three or four full days in the Summer. 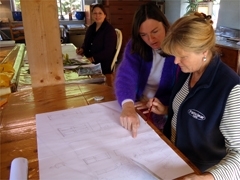 The group is led by professional tutor, Jacqui Beaumont. There is the opportunity to use a variety of media and style, to extend learning, try out new approaches and techniques but above all to enjoy picture making. We meet at the home of group member Jane Gamble, Rievaulx House, Chop Gate. Both beginners and those with more experience are welcome. Please bring sketching materials and reference for outside/inside of home or any other building of preference.